Beth is the Chairperson of Motor Neurone Disease New Zealand, and provided some very interesting facts about this incurable disease. MND is the third most common neurological disorder next to Alzheimers and Parkinsons. Approximately, there are 100 new cases reported each year, and there are currently a total of 300 people suffering this disorder. The disease causes the death of nerve cells that control the muscles that enable humans to move, speak, swallow, and breathe. There is worldwide diagnostic activity being undertaken to ascertain the cause of onset, but as yet there is no cure and work is continuing. The care and organisation of assistance to afflicted patients, is provided by Beth’s team, which is small but effective. Funds are scarce, and arrangements have been made to conduct an ‘annual walk for MND’. This is to be world-wide on 11th November. Our local walk will be held at Weka Park, Raumati. Funds are to be generated via this walk, which will be applied to assisting with research and the provision of equipment and assistance to patients locally. 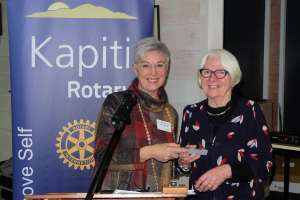 The Rotary Club of Kapiti has agreed to support this worthy cause, and Members will be encouraged to walk and help with local arrangements. Photo Caption: President elect Annemarie Tiffen congratulates Beth Watson on an excellent address, and assures her of our Club’s support.